He has been steeped in the industry and his opinion is well thought of by authorities. Kevin de Haan QC is a regulatory specialist in the fields of Consumer, Financial Services, Environmental, Health and Safety and Licensing Law particularly where an element of European Law is involved. 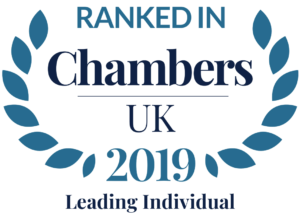 Kevin is recommended as a leading Silk in three practice areas by The Legal 500 and Chambers and Partners. He is highly experienced in all types of proceedings in his areas of expertise including judicial review, civil actions, civil and criminal enforcement proceedings and proceedings before the Court of Justice of the European Communities and courts in overseas jurisdictions. Bi-lingual in German, he acts for a number of German and Austrian clients. He is also fluent in French and Italian. Kevin de Haan QC is Joint Head of Chambers. Kevin deals with all aspects of consumer law including consumer credit both at national and European Level. He has considerable experience in e-commerce related matters and product safety matters, in particular medicinal and pharmaceutical products. He acted for Purely Creative Limited in proceedings before the Court of Justice of the European Communities. This was a landmark case concerning the scope of the banned practices contained in Annex 1 of the Unfair Consumer Practices Directive. He has advised the US manufacturers of the Segway personal transport in their efforts to clarify the position concerning its use on public roads in the UK and other EU jurisdictions. He regularly advises undertakings and institutions established both in the UK and other EEA jurisdictions on the impact of EU consumer legislation on their operations. Purely Creative Ltd & Ors v The Office of Fair Trading  EWCA Civ 920  EWCA Civ 920;  1 CMLR 21: Unfair Commercial Practices Directive; interpretation of Annex 1; use of premium rate lines in prize promotions. He advises extensively on virtual crypto currencies and blockchain technology in the spheres of both online gambling and FinTech. As an internationally acknowledged expert in all aspects of e-commerce regulation, Kevin has been closely involved in the development of the online gambling industry since its inception in the 1990s to the present day, having advised most of the major (and many of the smaller) operators at some stage. He drafted the Gibraltar Gambling Act and advised on regulatory aspects arising from the flotation of online gambling operators on the London stock markets. A consulting editor of Smith and Monckom on the ‘Law of Betting, Gaming and Lotteries’, he is an expert on the law relating to all types of gambling, both land-based, remote, national and European. He has long and extensive experience of advocacy before the Gambling Commission, local authorities, appellate tribunals of all descriptions, judicial reviews and proceedings before the Court of Justice of the European Union. His practice in this area has a strong international dimension. He is currently advising a number of operators both in the UK and abroad on the potential impact of their operations in European, Far Eastern, Middle Eastern and American jurisdictions. Since some form of gambling is now offered by many television operators, broadcasting is a substantial practice area for Kevin who advises on all aspects including European regulation. On the land based side, he was retained by Stanley Leisure (later Genting) in the spate of applications for casino licences under the Gaming Act 1968 during the transitional period prior to the coming into force of the new legislation. He also acted for Genting in their applications for Large Casinos under the Gambling Act 2005. Kevin is also highly experienced in all aspects of gambling taxation. R (on the Application of TC Projects Limited) v Newcastle Justices  EWHC 1018 (Admin): casino licensing; whether failure to comply with procedural requirement automatically invalidates application for licence. Kevin has over 25 years experience in liquor and public entertainment licensing having advised and represented many of the major brewery, pub, bar and nightclub operators including Regent Inns, Wetherspoons, Luminar, Academy, Chorion etc together with major retailers including Sainsburys, Asda, Tesco, Lidl, Morrisons, etc. He has particular experience in appellate proceedings and judicial reviews involving complex policy issues. R v Stafford Crown Court ex parte Wilf Gilbert (Staffs) Limited  EWHC Admin 167: costs in licensing cases; no rule that costs follow the event – position more akin to planning. Kevin is highly experienced in the planning, licensing and European law aspects of waste management with particular emphasis on administrative and criminal enforcement. He has been a licensed pilot for over 25 years and has developed considerable experience and expertise in the environmental and health and safety aspects of aircraft operation. He acted for Dunsfold Park Aerodrome in its successful appeal against a statutory nuisance abatement notice issued by Waverley Borough Council. Kevin is frequently instructed in fatal accident cases particularly those involving toxic and hazardous waste, explosive and flammable substances. He also has long experience of health and safety issues affecting the leisure and tourist industries. R v Boal (Francis)  3 All ER 177: company director, manager or officer only liable for regulatory breaches committed by the company if responsible for deciding corporate policy and strategy.